There are many benefits to taking out a prepaid funeral plan. A prepaid funeral plan protects you against inflation and rising funeral costs. It also protects your loved ones by reducing the stress and financial burden of arranging a funeral. According to the SunLife Cost of Dying Report, 2018, average funeral costs have gone up by 122.5% since 2004 and the projected average cost of a funeral will be £5,120.00 by 2023. 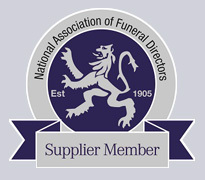 Our funeral plan prices are fixed at today’s costs so you will be protected against future rises in funeral director costs, also by taking out an Open Prepaid Funeral Plan you can rest assured that all your funeral director services will be paid for in full, regardless of any interim rise in the cost of your funeral director fees. Our funeral plan prices are fixed at today’s costs so you will be protected against future rises in ever increasing funeral director costs, also by taking out an Open Prepaid Funeral Plan you can rest assured that all your services will be paid for in full, regardless of any interim rise in the cost of your funeral director fees. 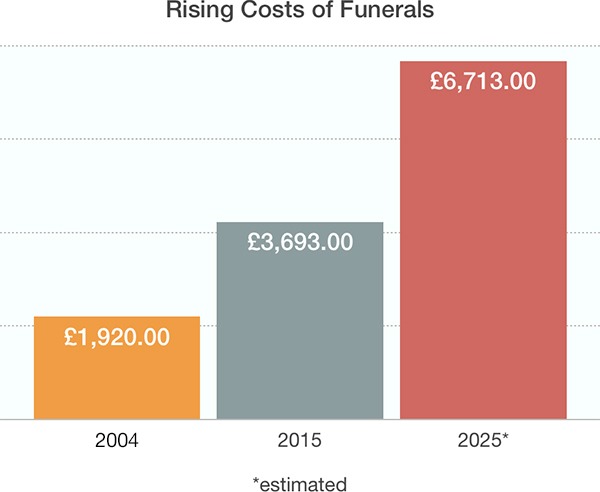 A funeral that might have cost £1,920.00 in 2004 could cost almost £4,271.00 in 2018, a huge increase over that period of time. By organising a funeral payment plan now you can be certain that neither your estate nor relatives will be overburdened financially in the future. Getting your affairs in order will give you a feeling of comfort in the knowledge that your loved ones will not suffer additional responsibility in the future. You will have taken from them a huge burden both emotionally and financially by taking action now. 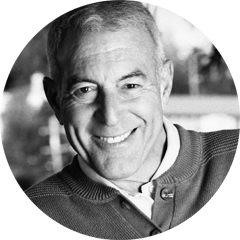 Not only can you be certain that the arrangements are exactly as you would want, but also that they will not have to be concerned about carrying out your wishes. A Funeral Plan also offers the added benefit of personalisation; you can be remembered the way you want to be. You can make your own decisions about your funeral and create a personal funeral that’s unique to you. It also reduces the concerns and stress of your loved ones who would otherwise be left to guess what you would have wanted for your funeral. An Open Prepaid Funeral Plan can offer all of the above, giving you financial reassurance and guarantee that you will receive the funeral of your wishes. We all know that we should be planning for our future, especially when it comes to our funeral. Prearranging your funeral may feel like an odd thing to do but for those you leave behind it’s a caring and selfless act. A prepaid funeral plan relieves your loved ones of the burden of planning your funeral during what will be a stressful and upsetting time. There are many questions that need to be asked when planning a funeral. By determining your choices now you can design a funeral to your personal taste. And our plans are flexible so if you change your mind about anything just get in touch. Do you know whether you want a burial or a cremation, and would your loved ones know your choice? If you choose a burial, you will need to make early decisions about your type of coffin, (for example, would you like a traditional, contemporary, wood or wicker coffin?). You’ll also need to consider where you want to be buried, a natural woodland setting or a traditional cemetery? Do you already have a plot purchased? If not should you consider this? Depending on whether you want your funeral to be a celebration of your life or a more sombre affair, music is a key element. By preplanning your funeral you can choose the songs you want to be played that reflect your personal taste. Whether you choose live, pre-recorded or a range of hymns, your choice is certain to be personal and moving. And believe us, you don’t have to be traditional with your choice, we have some wonderful and very funny choices from our plan holders! Many people would prefer their funeral guests to donate to a chosen charity rather than send flowers. This is one of the things you can specify when planning the finer details of your funeral. You can also determine whether you would like a personal tribute, simple or seasonal flowers. Whilst a hearse is the traditional method of transporting a coffin, you can specify whether you would prefer a horse-drawn or driven vehicle. These decisions also take into consideration the method of transport for your loved ones. There are so many choices these days that you can literally have almost anything to suit your personality. There are many other details that you may wish to consider for your funeral. This is why Open Prepaid Funerals offer bespoke funeral planning alongside our standard plans.